for sale in our Tasting Room. We also carry a wide selection of merchandise, including gift packaging, glassware, shirts, hats and cocktail paraphernalia. Check out our newly launched fall/winter tasting room food and drink menu! We try our hardest to source locally made meats and cheeses and offer as many gluten friendly and dairy free options as possible! Visit Eau Claire Distillery for a fascinating, behind the scenes look at how spirits are made. Your tour includes a visit into our working distillery amidst our beautiful, German made copper distilling towers, a visit into our exclusive dunnage barrel warehouse and a tasting of Eau Claire products, including some which are available only at the distillery. This unique facility is one of the most talked about new tourist attractions in Alberta. We encourage groups to book ahead. Bookings must be made 48 hrs in advance to leave room for walk-ins. Please call our tasting room for further assistance, 403-933-5408. Open 11am – 5pm. No Tours on Weekdays. Tours on Friday, Sat & Sun at 1pm & 3pm. First come, first served or by reservation. Group bookings & private functions welcome! NOTE: You must be 18 or older to enjoy a Tour or Tasting. We are located approximately 45 minutes from downtown Calgary. Travel south until you reach Stoney Trail/Highway 22X. Turn left (south on Highway 22/Cowboy Trail) until you come to the town of Turner Valley. 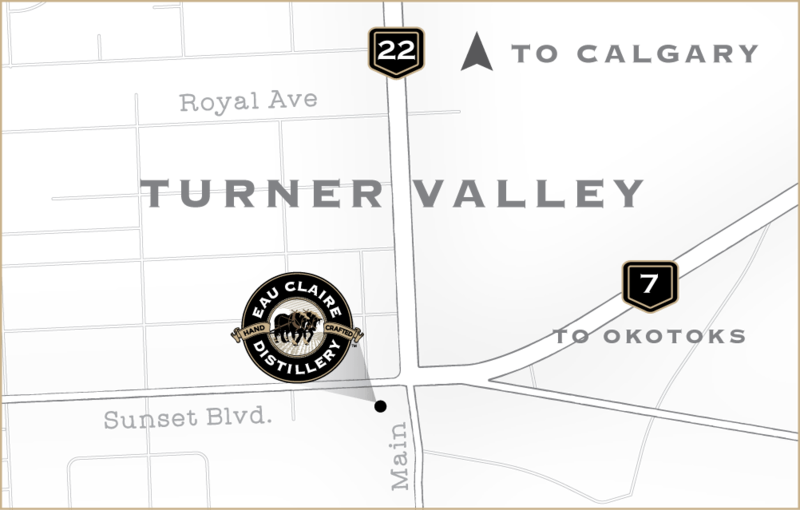 Eau Claire Distillery is in the Centre of Turner Valley at 113 Sunset Boulevard.